I hope your Saturday is off to a great start! 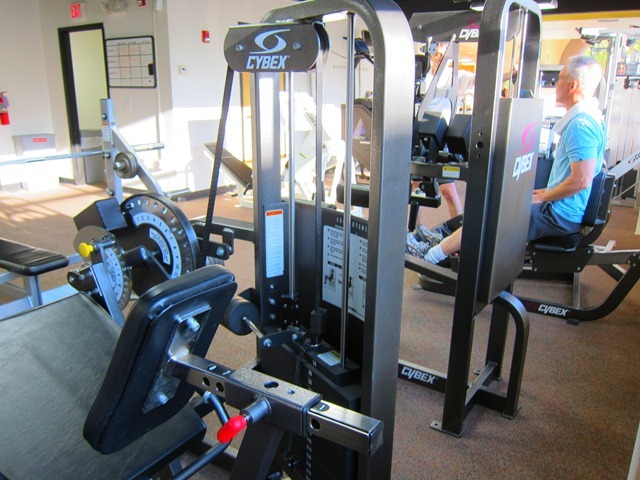 Our morning began the sweaty way with a workout at the gym. To begin, Ryan and I completed cardio side-by-side on the treadmill. I did a slight variation of my 20-minute incline walking/running workout and was sufficiently sweaty by the time 20 minutes passed. We then headed upstairs and split up to complete our respective weights workouts. 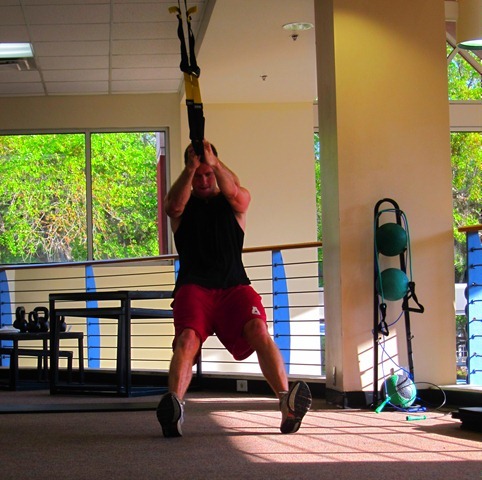 I did a total-body weights workout which I finished before Ryan was done doing super-crazy man things on his TRX straps. Naturally I entertained myself by playing around on an exercise ball until he was done. Once Ryan was done, we headed home for breakfast. Of course we had to use the Vitamix again and made chocolate, peanut butter and banana smoothies… heavy on the peanut butter, of course. I know I’ve only made two smoothies with the Vitamix so far, but already I am loving it. My previous blender would really struggle with chopping ice, but the Vitamix does so with ease. I seriously think it could blend your arm! The smoothie was delicious and Sadie was more than happy to help with clean up duty. She takes after her mama. Peanut butter puppy! Now it’s time to entertain the pup. It’s currently a toss up as to whether we’re going on a walk or heading to the dog park. « We Finally Bought It! I’m so glad you’re enjoying the VitaMix. I LOVE mine! Yum- that smoothie looks good!! 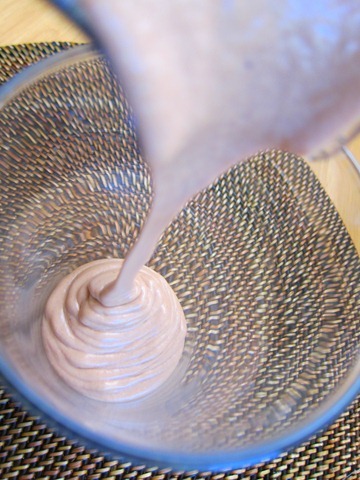 I love smoothies- this one is so simple. Definitely gonna try it! the TRX bands scare me but I’ve heard lots of good things ’bout them. I should get over my fears and try them out! I’d probably be eating smoothies for breakfast, lunch and dinner if I got a Vita. Congrats on your new “baby”! I’m so jealous of your vitamix! I saw them at Costco a few years ago and was in awe when they made ice cream AND soup with the same machine. Have you seen this website? http://www.willitblend.com/ I wonder if its a vitamix. They blend everything and anything. I so love the pics that you take of Sadie…..all nose! Lol…..
oooh looks yummy – sadie definitely thinks so! 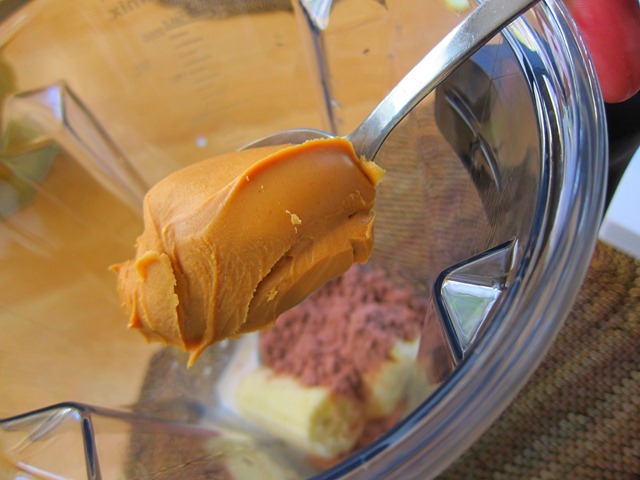 i think i may have to whip up these PB & banana smoothie you talk about! Those are great shots both of you on the ball and your dog! 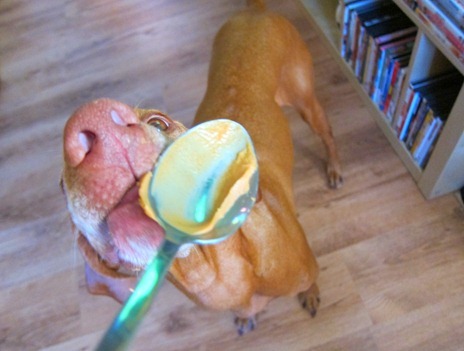 Dogs love peanut butter don’t they? I’m going to go fill my dog’s chewy with fresh peanut butter right now. Yum I really want one now! Sadie is so cute! My dog sits next to me and drools everytime I open a jar of PB. I always let her lick the spoon. She also loves when we fill her Kong toys with peanut butter! I adore your pup pictures, where the close up is of her cute little nose and the rest of her looks itty bitty. Super cute!! My gym workout had me sweating like a mofo today and went home for noodles – your smoothie looks loads nicer than my boring noodle dish! I am still 100% jealous of your Vitamix 🙂 I’m glad it is living up to the hype! I want your smoothie! I am craving something like that…so I just may find myself at the fro-yo place later on today. I need a new blender and was wondering if anyone would recommend their vitamix or not. Fro yo, I miss you!!! Didn’t want to make you jealous by saying that Julie, ha! There’s a new place here called Orange Leaf and they have 16 different flavors of self-serve fro-yo. I went there 3x’s last week. Obviously I didn’t give a thing up for Lent. That smoothie looks deeeelicious, I’m going to have to try it. 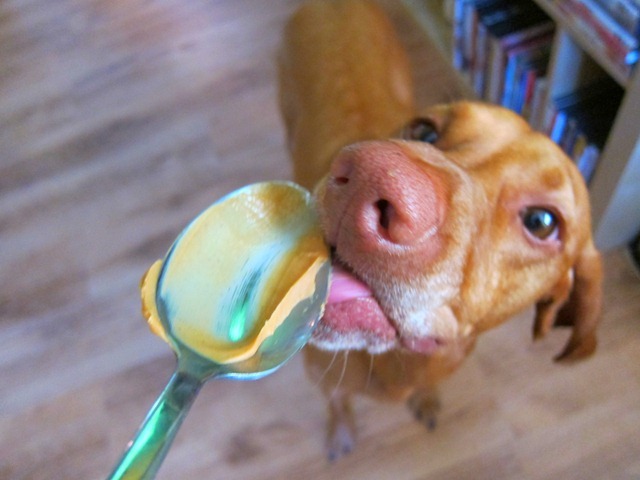 My puppy LOVES peanut butter too! I actually buy him peanut butter-filled bones at our local pet store, he can chew them for hours! You made me want one of those blenders! <3 Sadie! I think for our apartment (first apartment, moving out of the dorms!!!) we are going to get a Ninja blender. But the cheaper one that is at Sam's/Costco for like $150 tops. A vitamix would be nice, but I don't have that kind of money! I love my vita mix as well! You can make amazing soups and dips with mahine as well. The booklet comes with a good tortilla soup recipie. Your smoothie looks amazing!! I want one now. So cute, have a great day with the family! That is a great smoothie recipe!!! I love that you and your hubby workout together! thanks for the good info on the vitamix!!! The vitamix could totally blend your arm. I had a friend successfully (and accidently) completely blend a fork. Um yeah….crazy how powerful that little sucker is! So jealous of all the sunshine streaming into your gym and green trees outside! My gym has very little natural light, and we still have a lot of snow outside! I guess it’s my own fault for moving to Alaska–what was I thinking?!?! haha i love her nose all pressed up by the lens! 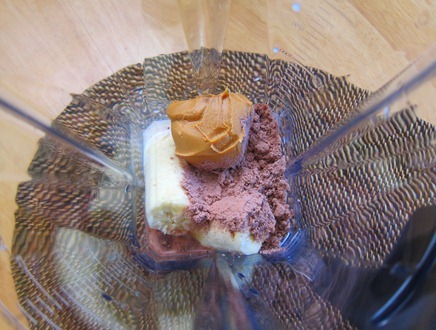 Yummy smoothie combo! I had no bananas today so I had to roll with blueberries in my smoothie! Love the sadie pics! so cute, she loves her PB like her mommy! I totally understand your love for peanut butter. I especially love peanut butter protein shakes and have to limit myself to two a day. Your blog is delightful. that smoooooothie LOOKS SO SMOOTH And silky! … EEEK! you wouldnt wnt to make that arm mistake for sure! Awwww….look at the doggie schnozzzzzzzz. What a cutie! I have blender envy! That smoothie looks soooo lucious! Love the pictures in this post! Sadie always makes me smile! I have a vizsa too–his name is Buddy 🙂 he’s almost five and a half years old but still acts like a puppy most of the time. Those vizslas are so active! I LOVE my vitamix. BEST purchase .EVER. Chocolate, Peanut butter, Banana and Instant espresso powder. That coffee flavor is sooo tasty in there. For my Vanilla protein powder i am loving Mango and blueberry. Yum!